What does buying a car have in common with online dating? Quite a lot, according to Cars.com Chief Marketing Officer Brooke Skinner Ricketts. Skinner Ricketts shared the success of marrying data about cars and car buyers with a creative “matchmaking” approach that Cars.com is using in its new marketing campaign. She talked with Medill students, faculty and alumni about linking data and creative thinking at a professional development and networking event in February at Medill Chicago. The Medill Integrated Marketing Communications program encourages marketers to build strategies based on data about customers’ needs and wants. Cars.com used a similar model and was able to use its 20 years of consumer car shopping data to create the ultimate car matchmaking experience. This experience helped Cars.com act on their goal to make car shopping a more successful, and enjoyable, experience, said Ricketts. Cars.com sees about 44.5M visits per year. This made it important for Cars.com to work on increasing its level of engagement with visitors. 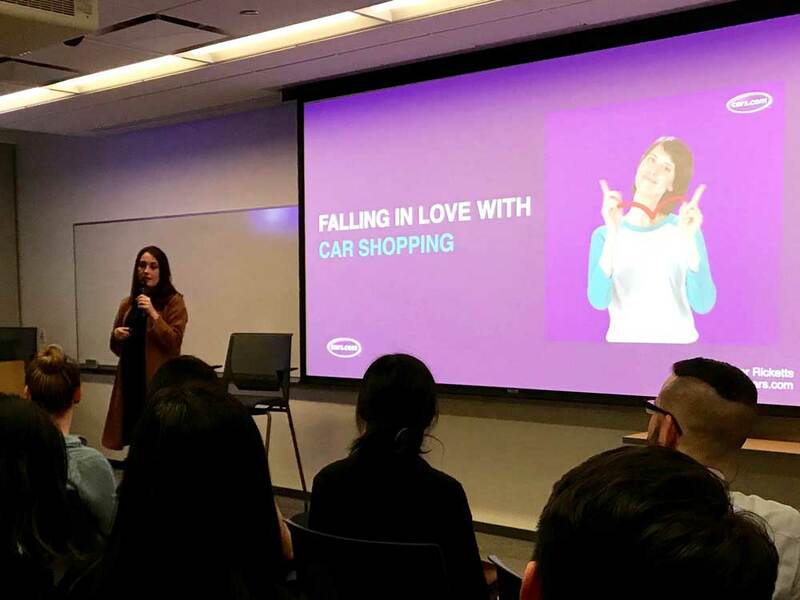 With the tagline “We Met on Cars.com”, the brand set to help consumers find the right car the same way people online date. Customers take a quiz to figure out which car models will best fit their needs, along with comprehensive vehicle data. It also requires people to make accounts on Cars.com and let them save their matches—exactly like on online dating websites. “Based on what you tell us, we can recommend not just make and model but actual inventory that’s nearby so you can go check out that inventory,” said Skinner Ricketts. The campaign was bolstered by media placements that included 30-second, 15-second and six-second video ads across TV, digital and social channels. There were also ads specifically for Tinder to reinforce the matchmaking experience. The campaign, which continues today, has drastically increased the number of visitors the Cars.com site and has provided new consumer insights. This helped Cars.com to add even more data to its already large database—making the matchmaking experience even more successful.